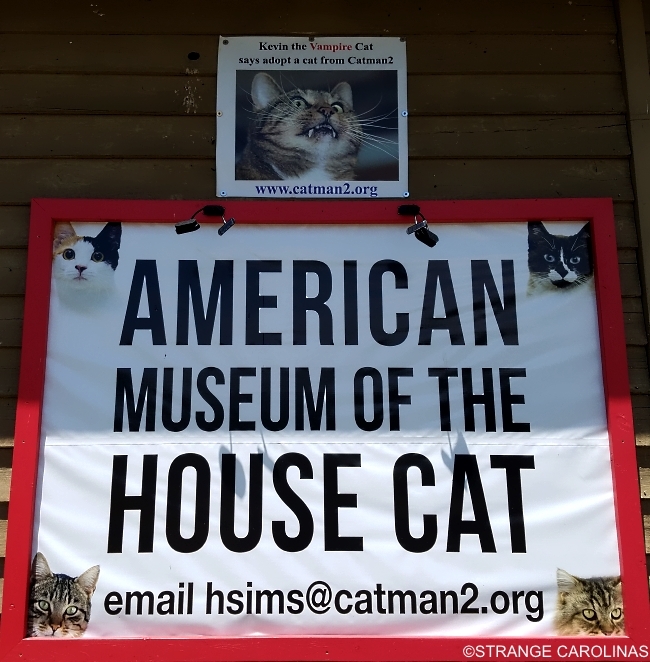 The American Museum Of The House Cat opened its doors on April 1st, 2017. 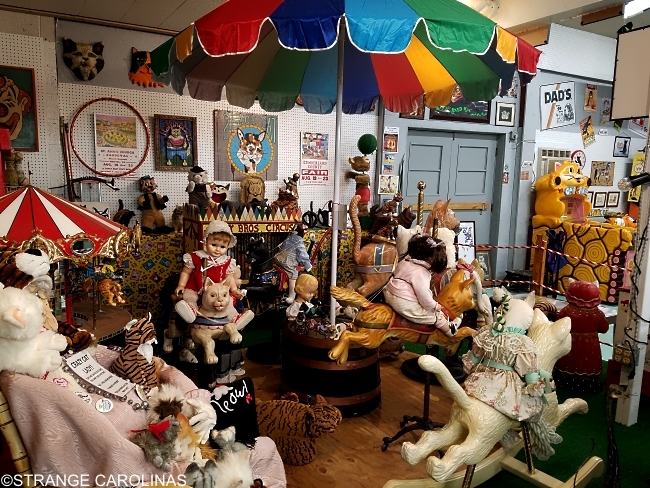 Harold Sims brought his love of cats and vast collection of cat memorabilia to the Old School Antique Mall in Sylva, NC, as a way of sharing his collection with the world and to help finance his no-kill, no-cage cat shelter, Catman2. 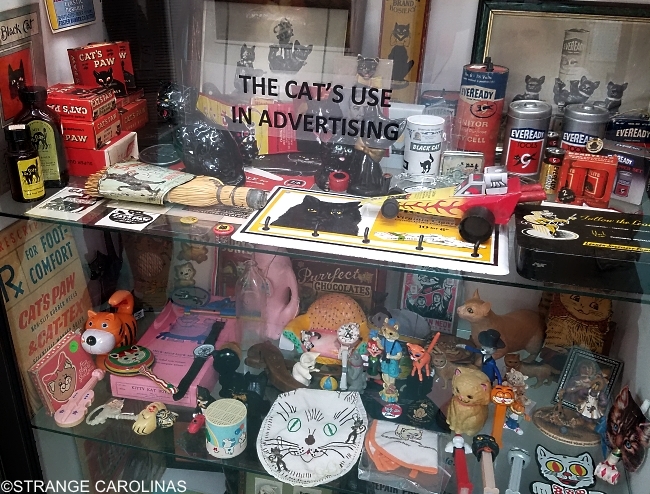 Since its opening a little more than 3 months ago, the American Museum Of The House Cat has attracted thousands of visitors and has appeared in numerous newspaper articles, television news reports, and was even featured in Smithsonian Magazine. 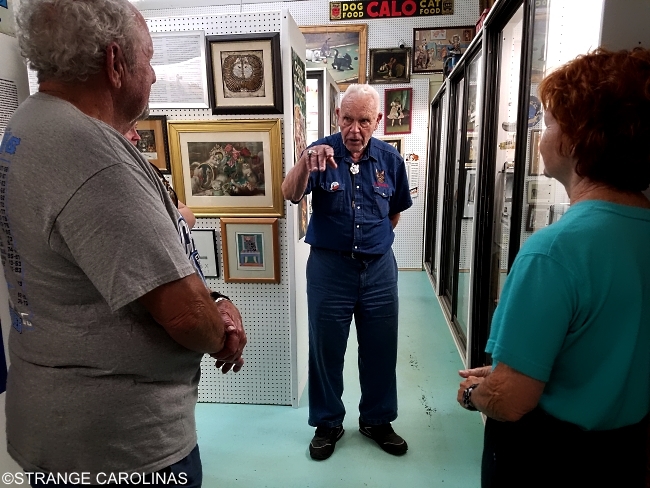 We had to see what all the fuss was about so we dropped by the museum during a recent trip to the NC mountains to check out the collection and to speak with Mr. Sims. 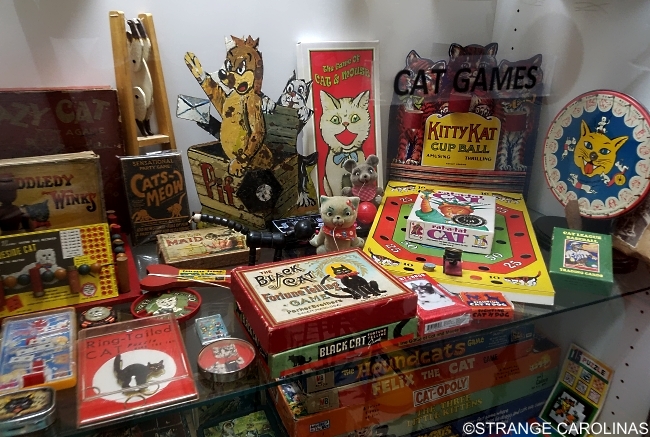 How long have you been collecting cat items? About thirty years. 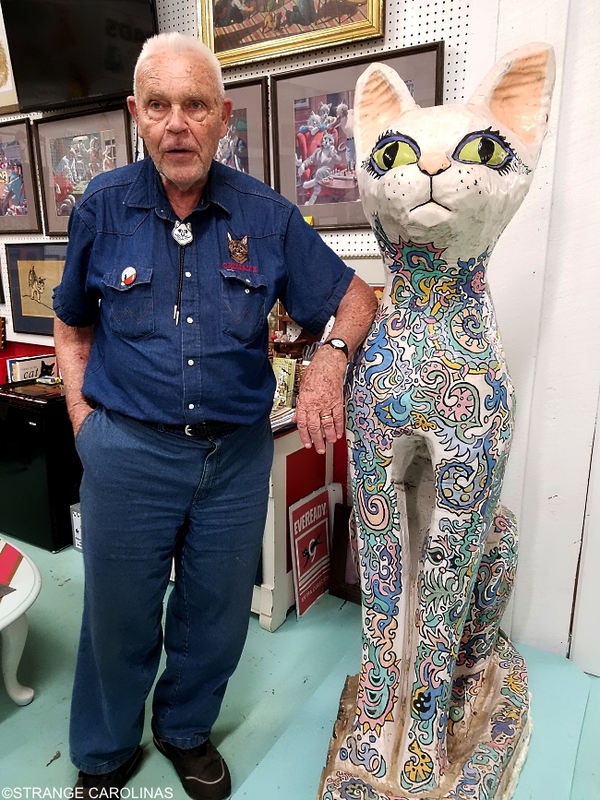 I started out collecting antiques in Florida to resell. 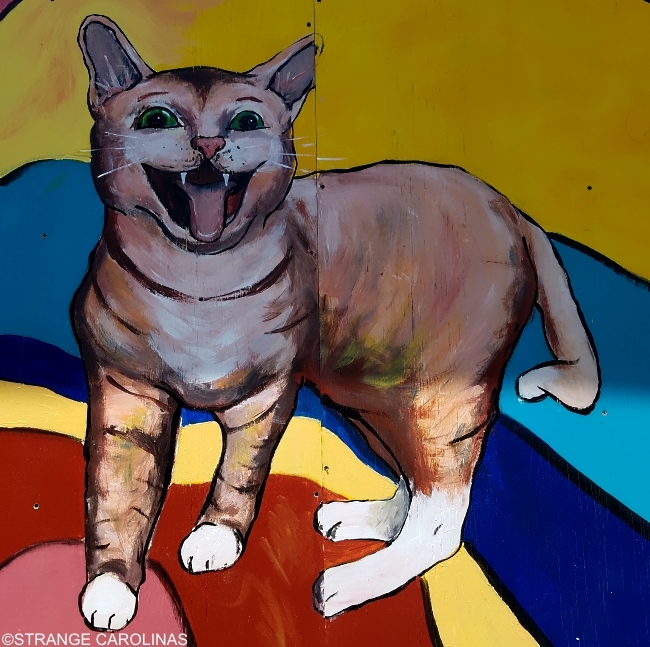 I found some cat pictures one day. 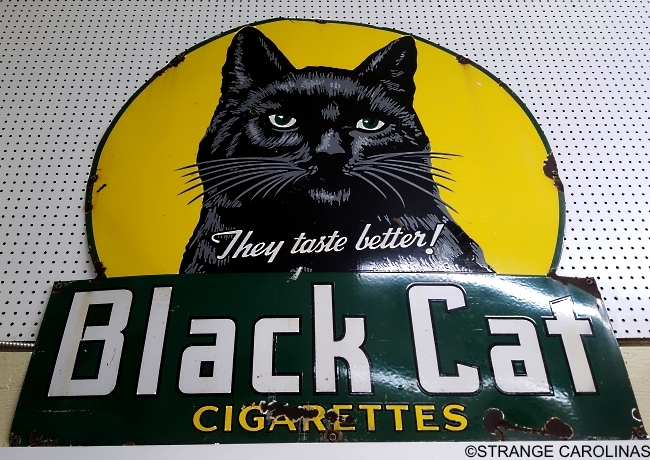 I've always like cats. It started about thirty years ago and I've been putting them in boxes, up on the shelf, in the attic, and all that. 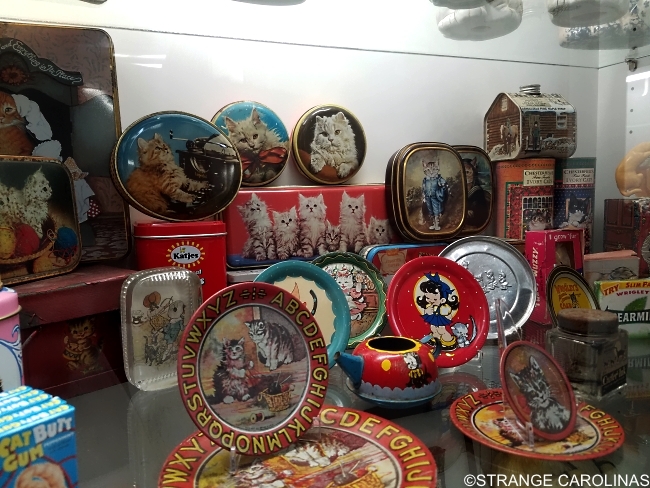 I've always wanted to have a museum. This place finally had a couple of empty spaces to use. It took me about six months getting read to open up. We've got about 1,000 square feet here, which is probably a third of what I need. I have more stuff I could hang up, lots of art. I'm hoping someone comes along one day and says, "I'm going to be your Carnegie and build you a big museum some place." I've got an amazing collection with things you don't see. It's a premiere museum with not even space to show everything it could show. I need help and I also need money to keep it going. I've had to pay rent for this thing but I don't take any money for myself. I worked for forty years as a teacher and my wife also worked most of her life so we have retirement income. We don't need the money. I can afford to do this so any money we make goes into the cat shelter. Any idea how many pieces you have total? Somebody's going to do a count. I'm saying around 5,000 here now. They're going to do a count and try to enter it in the Guinness Book of World Records. I know I've got probably the most cat wind-up toys of anywhere in the world. We're going to do a video here next spring when the museum closes for the season. I've going to make a DVD of all the wind-up toys moving across the floor and try to sell out. Hopefully I can sell some of those to people who want to go home and watch the cats run around on their TV screen. 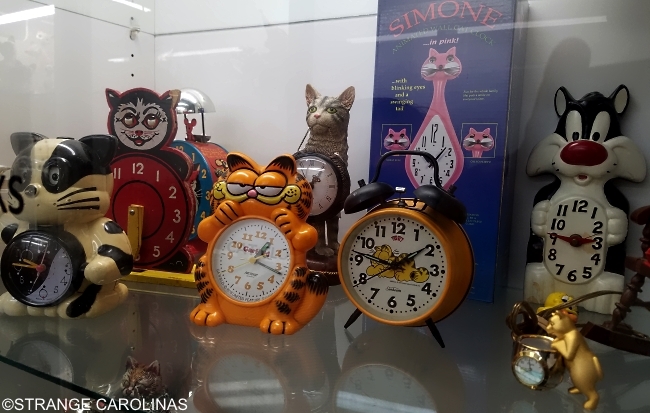 This cat behind me here is one of the things I like the most. 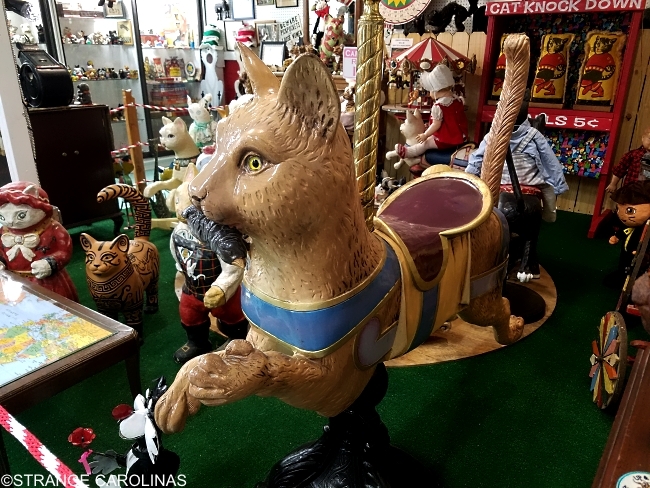 I've also purchased a Dentzel Carousel cat that's over at the house waiting for a pole and stand. I wanted one of those years ago. 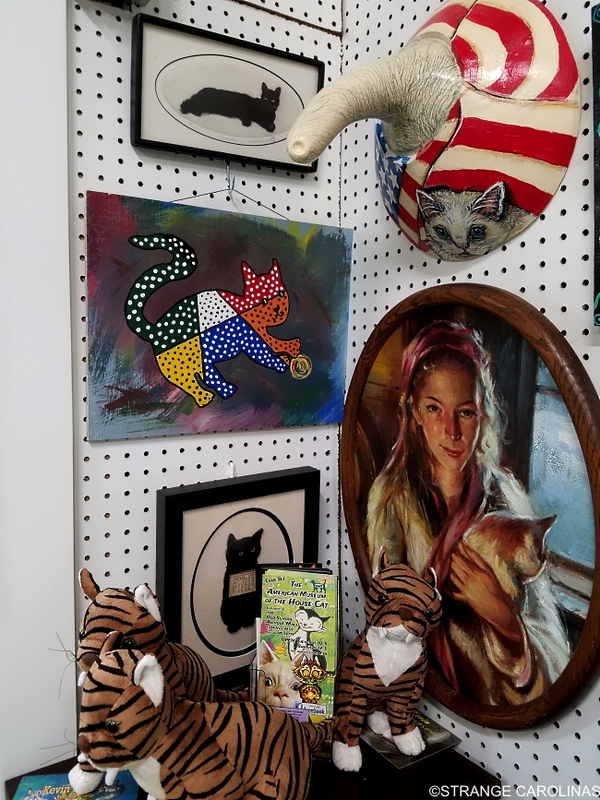 I went to an auction in Tampa, Florida. I've always liked circus stuff. 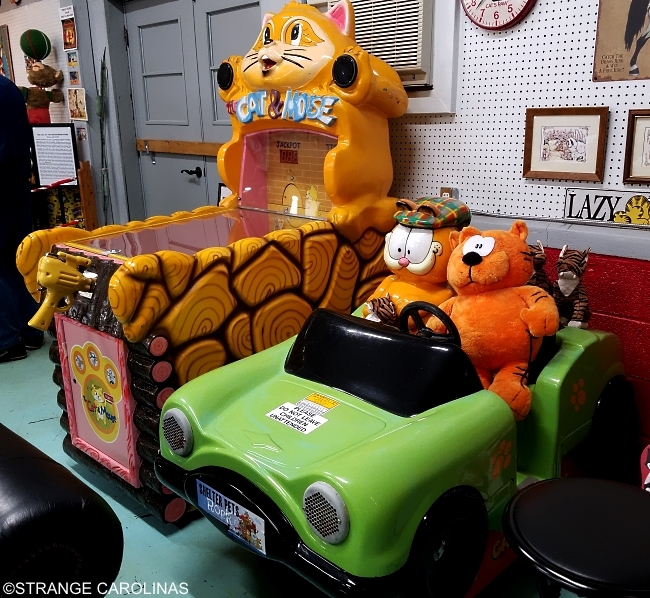 At the time I went there, they were getting rid of merry-go-rounds and getting into roller coasters. 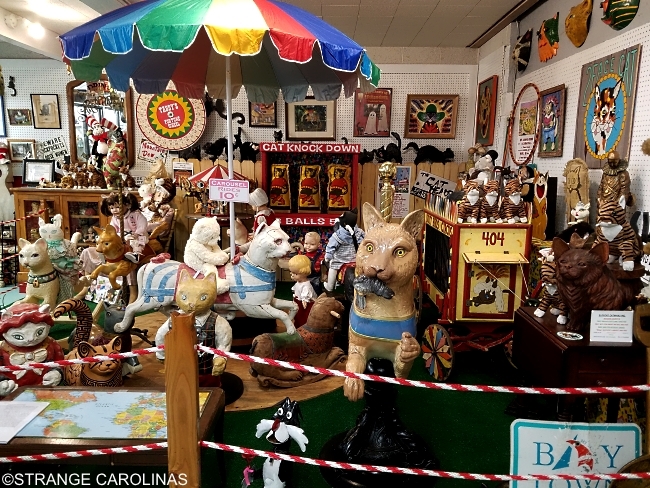 I went to the auction and they had a Dentzel Carousel cat that I just fell in love with but it went for $110,000. I said I'll never be able to buy one of those. But now they've gone down like everything else. 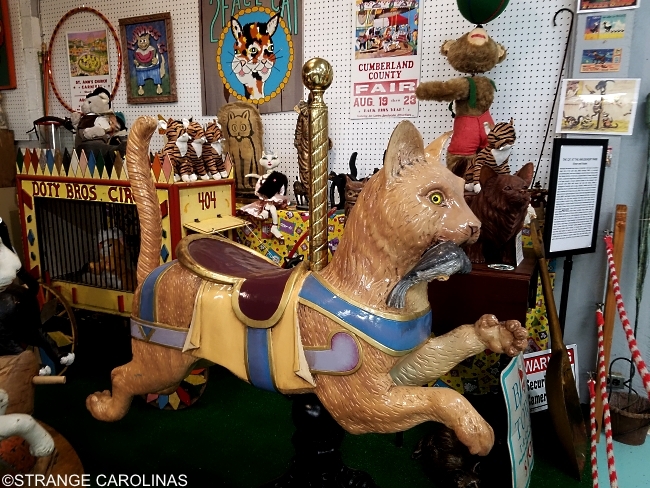 I finally did find a Dentzel Carousel cat online and I bid $13,000. I've wanted one of those forever and I figured I'm 82 years old now and I'm not going to live forever. 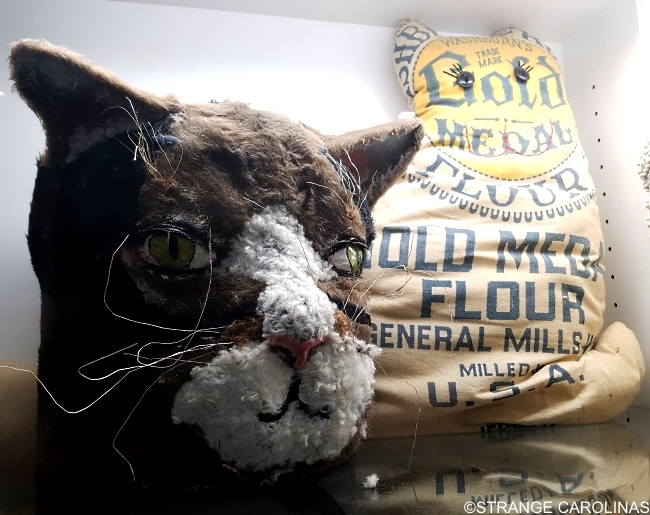 What is the story behind the giant cat? 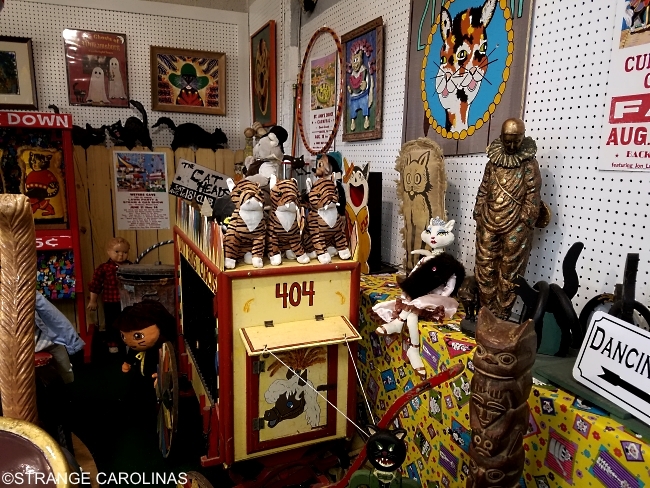 A woman here in Sylva opened up an art shop years ago. She had two cats for pets that were in the shop with her that were Persian cats. 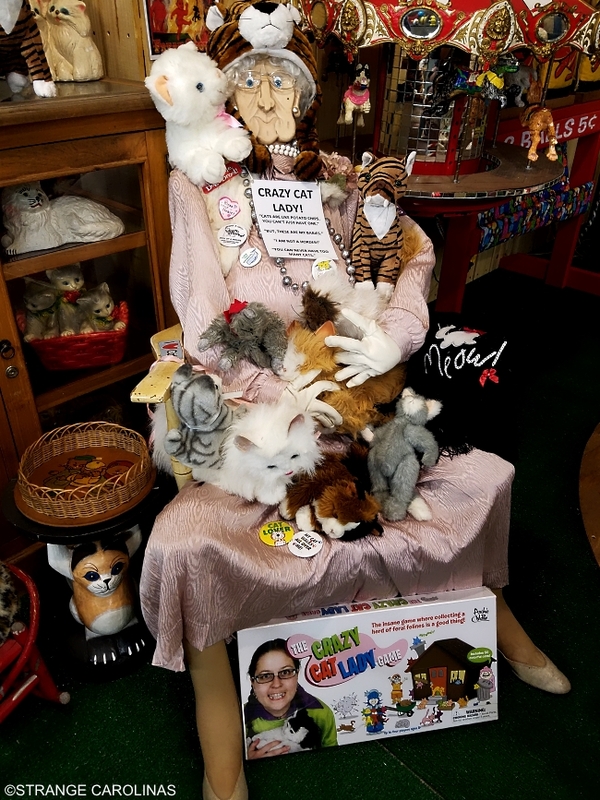 She bought the cat in Asheville to put out in front of her store to attract people to her store. When she bought the cat, it was just wood, nothing fancy about it at all. She had somebody at the college sand it down and paint it to make it more attractive in front of her store. It started to get wet from the rain and stuff and the wood began to rot and deteriorate. She said, "If you want it, you can have it. I'm closing the store up." I got the cat and put it over at my shelter and it was there for ten years or more and then I brought it over here. When I moved it, a lot of the wood at the bottom was still weak and it fell off. 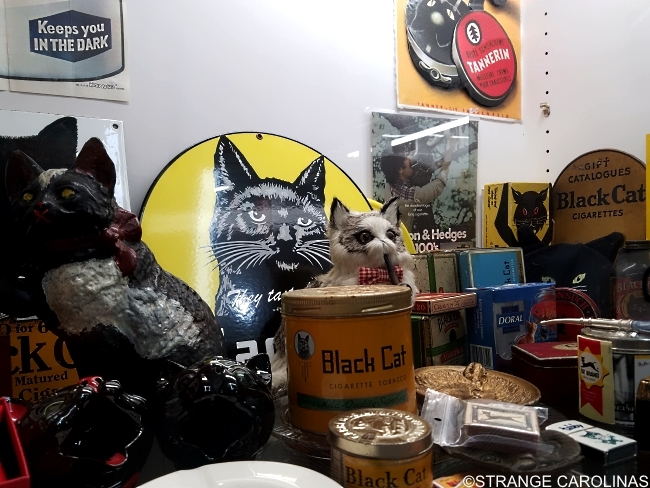 My guess is that the cat came to her from Asheville, came there from Virginia, and they got it from England out of Liverpool. My guess is that when the English had the worldwide colonization, somebody went to Asia into one of the colonies the English were ruling at the time. This is a temple cat, from a temple. They either bought it or stole it and kept it as a souvenir. I'm still trying to get the time and ability to send off a piece of the wood to find out what kind of tree it was made from and get carbon dating on the wood to see how old it is. 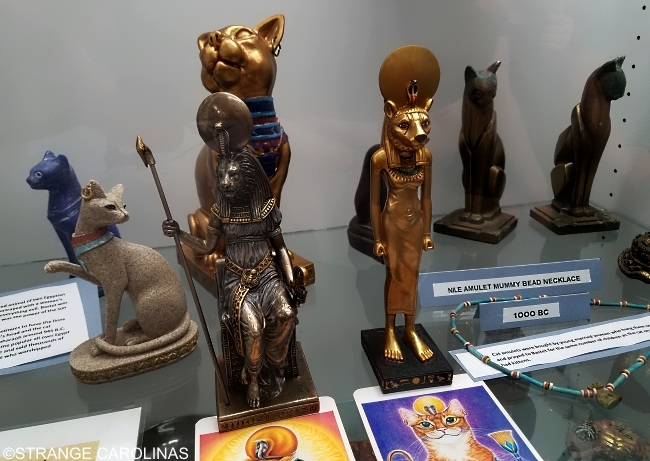 My guess is it's an old temple cat from Borneo, Malaysia, or Singapore, or somewhere like that. 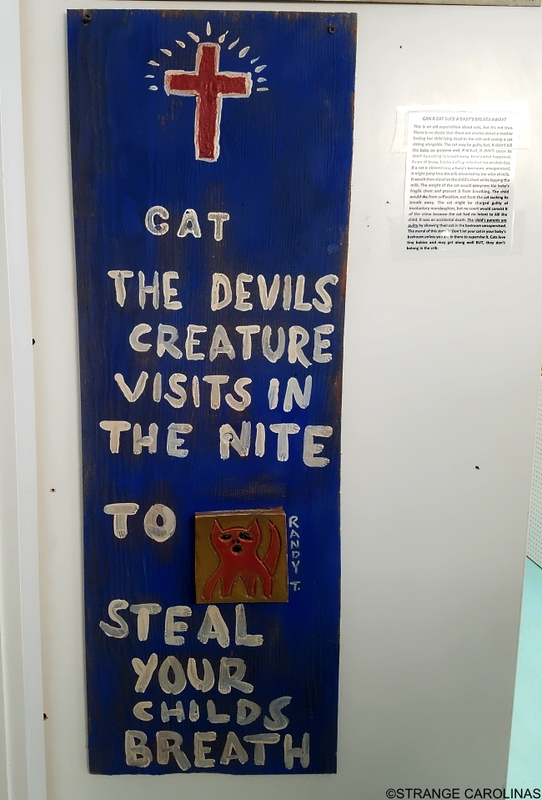 All the proceeds from the museum go toward your shelter, right? Yes. 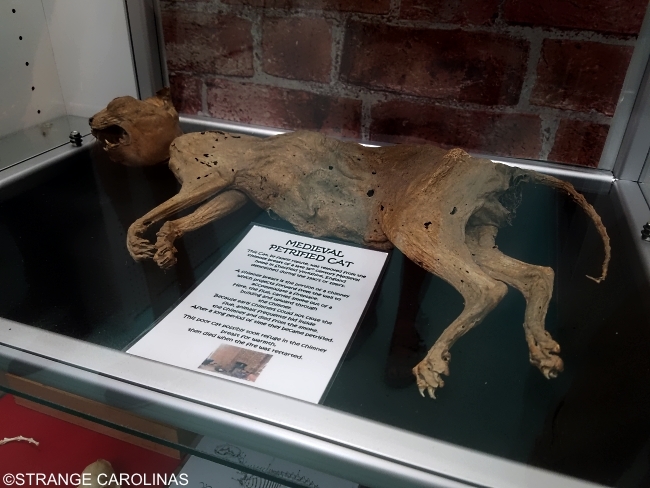 The proceeds from the museum, after we pay the rent and pay the help, will go to help the Catman2 cat shelter. How long have you been running that? 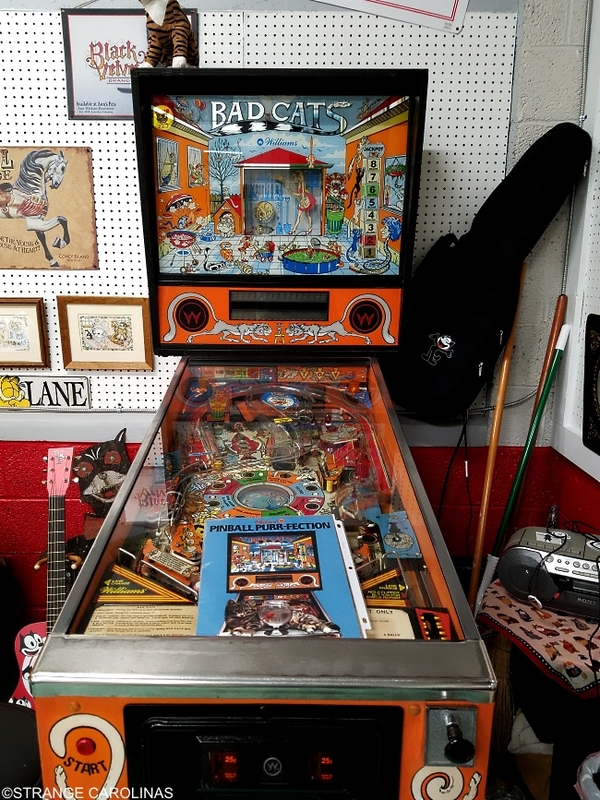 I started rescuing cats in a tool shed in 1996. I had an aunt that died and left me some money, so I could afford to buy a bigger place. 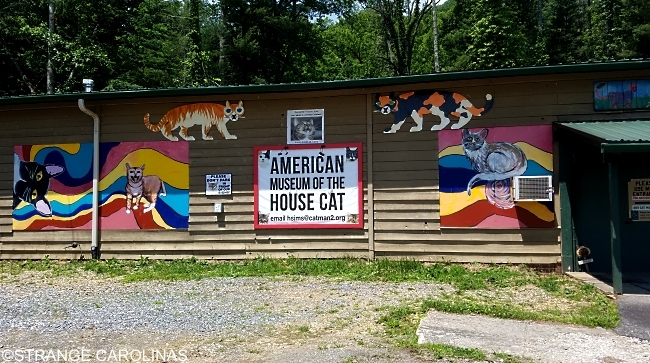 We built the cat shelter and opened up in 2002. 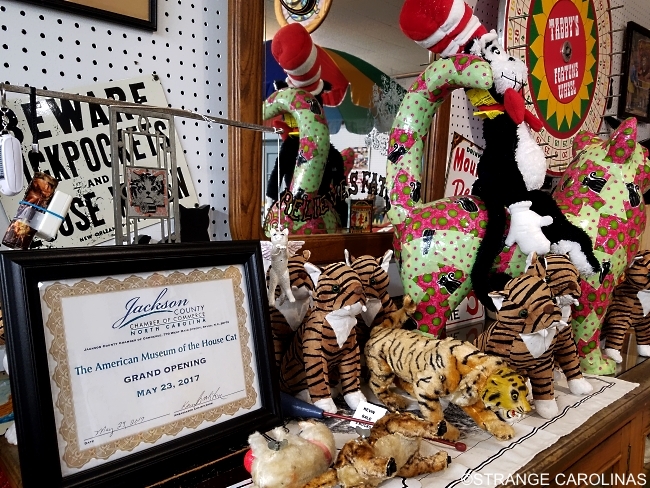 Since we've opened, we've adopted over 3,000 cats. We've also been able to start a spay and neuter program in town. 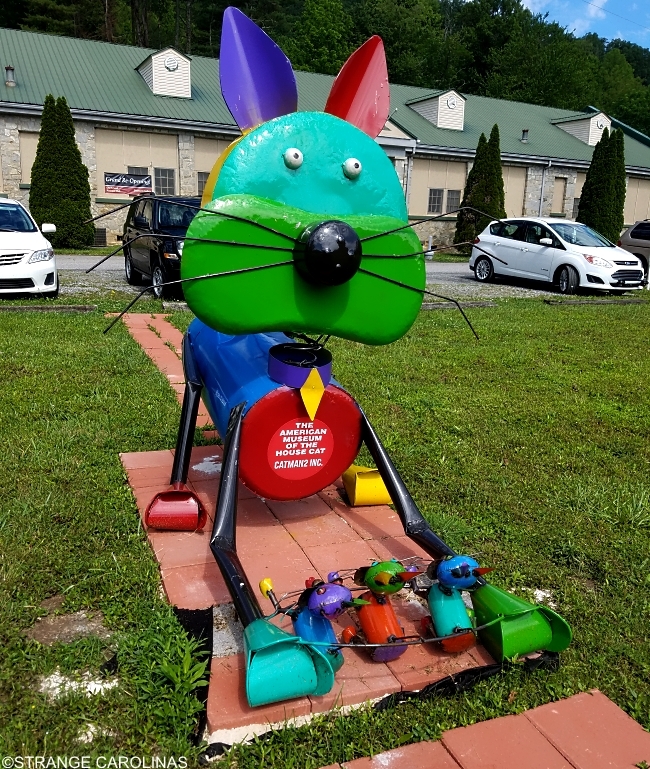 We're really doing a big help to the cats around Sylva. 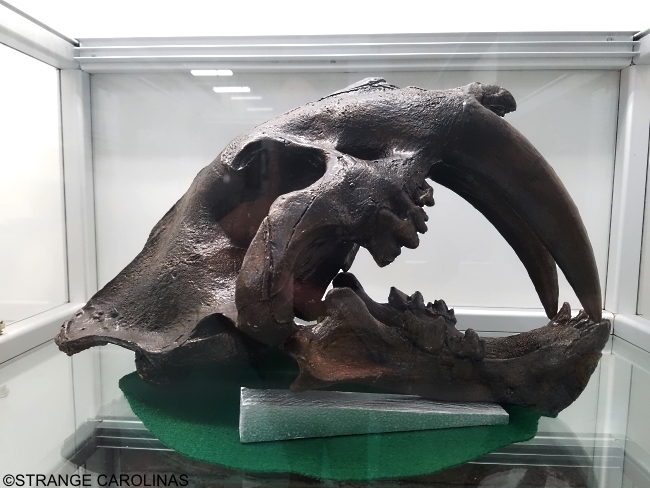 How are things going so far with the museum? So far I think we're doing pretty well. I think we may exceeded our cost for this month (as of June 14th). In the second month, we made double the rent. This month, we're probably going to triple the rent, so we can give money to the shelter to buy cat food and get cats neutered and spayed.